377LM Wireless Keyless Entry System. Access your garage and home without the use of a key or a remote control. The LiftMaster® Security+® Wireless Keyless Entry can open your garage door using a code that you program directly into the unit. There is also a temporary password option that enables family, friends, or service people to enter the garage/your home without giving them your personal code. 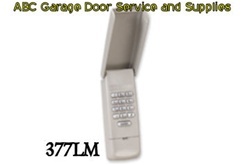 The Liftmaster Garage Door Opener Model Numbers Below Use A Purple Learn Button To Program The Remotes Or Keypad.